[Update]: You can read Chinese version of this article here. For sure, Chrome being the market leader in web browsing, Chrome Headless is going to be industry leader in Automated Testing of web applications. So, I have put together this starter guide on how to get started with Web Scraping in Chrome Headless. Puppeteer is the official tool for Chrome Headless by Google Chrome team. Since the official announcement of Chrome Headless, many of the industry standard libraries for automated testing have been discontinued by their maintainers. Including PhantomJS. Selenium IDE for Firefox has been discontinued due to lack of maintainers. Puppeteer’s team had concerns about the usage of jsdom when page.evaluate method could be used for DOM manipulation. So, I have updated the code snippets as well as the repository to rely on evaluate method for text extraction. 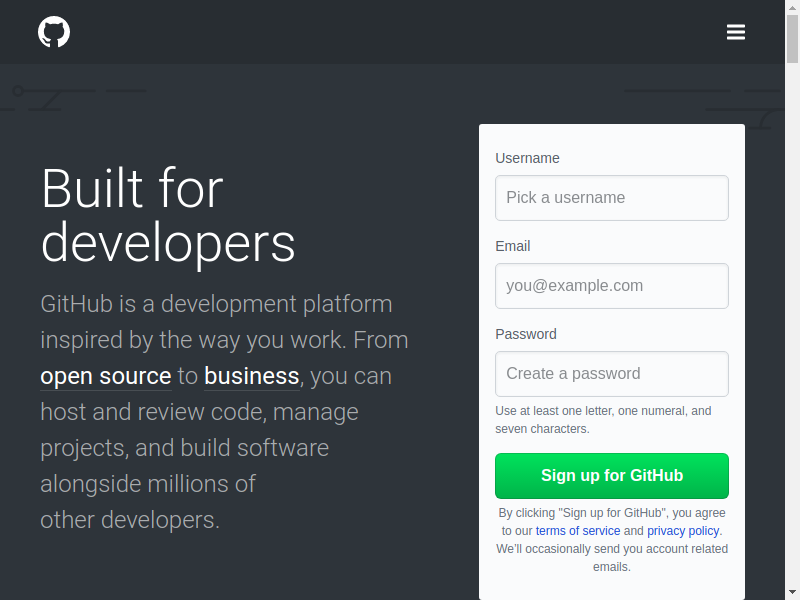 In this guide we will scrape GitHub, login to it, extract and save emails of users using Chrome Headless, Puppeteer, Node and MongoDB. 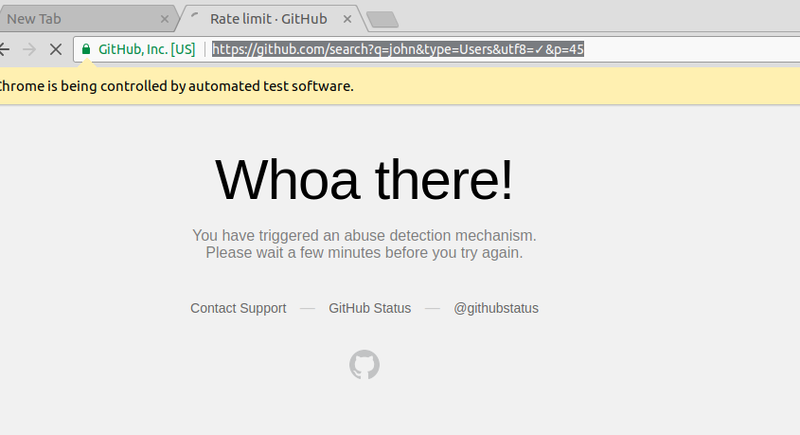 Don't worry GitHub have rate limiting mechanism in place to keep you under control but this post will give you good idea on Scraping with Chrome Headless and Node. Also, stay updated with the documentation because Puppeteer is under development and APIs are prone to changes. Here is the accompanying GitHub repository. Before we start, we need following tools installed. Head over to their websites and install them. Initiate NPM. And put in the necessary details. Install Puppeteer. Its not stable and repository is updated daily. If you want to avail the latest functionality you can install it directly from its GitHub repository. Puppeteer includes its own chrome / chromium, that is guaranteed to work headless. So each time you install / update puppeteer, it will download its specific chrome version. We will start by taking a screenshot of the page. This is code from their documentation. If its your first time using Node 7 or 8, you might be unfamiliar with async and await keywords. To put async/await in really simple words, an async function returns a Promise. The promise when resolves might return the result that you asked for. But to do this in a single line, you tie the call to async function with await. Save this in index.js inside project directory. Also create the screenshots directory. The screenshot is now saved inside screenshots/ dir. If you go to GitHub and search for john, then click the users tab. You will see list of all users with names. Some of them have made their emails publicly visible and some have chosen not to. But the thing is you can’t see these emails without logging in. So, lets login. We will make heavy use of Puppeteer documentation. Add a file creds.js in project root. I highly recommend signing up for new account with a new dummy email because you might end up getting your account blocked. For visual debugging, make chrome launch with GUI by passing an object with headless: false to launch method. 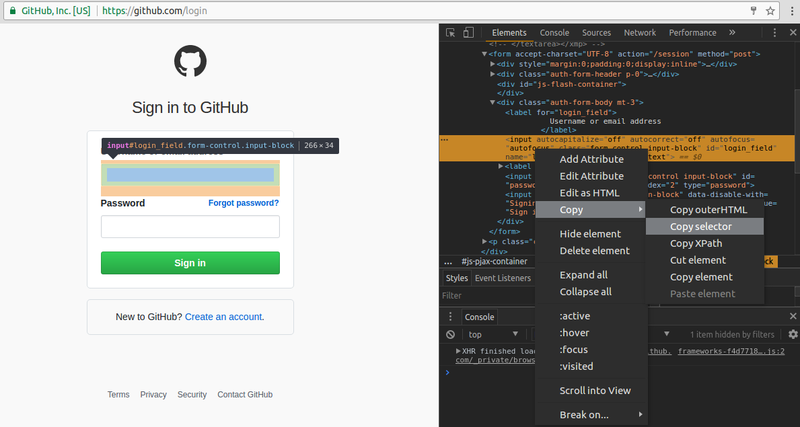 Open https://github.com/login in your browser. Right click on input box below Username or email address and select Inspect. From developers tool, right click on the highlighted code and select Copy then Copy selector. Puppeteer provides methods click to click a DOM element and type to type text in some input box. Let's fill in the credentials then click login and wait for redirect. Up on top, require creds.js file. Lets navigate to this page and wait to see if it actually searched? We are interested in extracting username and email of users. Lets copy their DOM element selectors like we did earlier. You can see that I also added LENGTH_SELECTOR_CLASS above. If you look at the page's code inside developers tool, you will observe that divs with class user-list-item are actually housing information about a single user each. Currently one way to extract text from an element is by using evaluate method of Page or ElementHandle. When we navigate to page with search results, we will use page.evaluate method to get the length of users list on the page. The evaluate method evaluates the code inside browser context. Let’s loop through all the listed users and extract emails. As we loop through the DOM, we have to change index inside the selectors to point to the next DOM element. So, I’ve put the INDEX string at the place where we want to place the index as we loop through. Now if you run the script with node index.js you would see usernames and their corresponding emails printed. First we would extimate the last page number with search results. At search results page, on top, you can see 69,769 usersat the time of this writing. 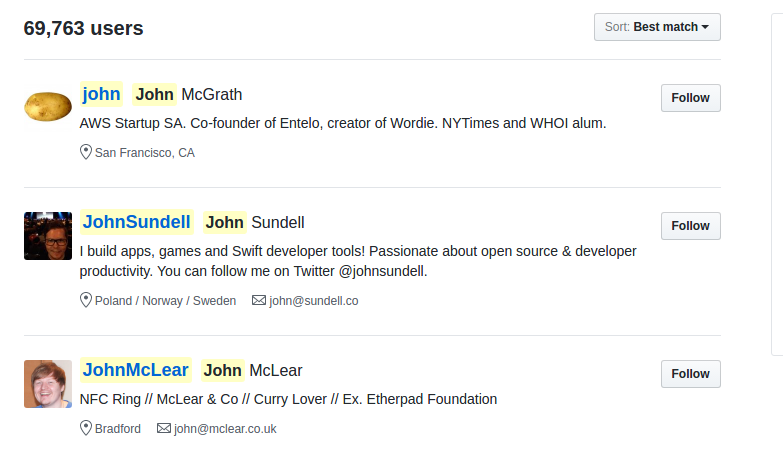 Fun Fact: If you compare with the previous screenshot of the page, you will notice that 6 more john s have joined GitHub in the matter of a few hours. Copy its selector from developer tools. We would write a new function below the run function to return the number of pages we can go through. At the bottom of the search results page, if you hover the mouse over buttons with page numbers, you can see they link to the next pages. The link to 2nd page with results is https://github.com/search?p=2&q=john&type=Users&utf8=%E2%9C%93. Notice the p=2 query parameter in the URL. This will help us navigate to the next page. The part with puppeteer is over now. We will use mongoose to store the information in to MongoDB. Its an ORM, actually just a library to facilitate information storage and retrieval from the database. MongoDB is a Schema-less NoSQL database. But we can make it follow some rules using Mongoose. First we would have to create a Model which is just representation of MongoDB Collection in code. Create a directory models. Create a file user.js inside and put the following code in it, the structure of our collection. Next whenever we insert something into users collection with mongoose, it would have to follow this structure. Let’s now actually insert. We don’t want duplicate emails in our database. So, we only insert a user’s information if the email is not already present. Otherwise we would just update the information. For this we would use mongoose’s Model.findOneAndUpdate method. You would see multiple users added there. This marks the crux of this guide. Chrome Headless and Puppeteer is the start of a new era in Web Scraping and Automated Testing. Chrome Headless also supports WebGL. You can deploy your scraper in cloud and sit back and let it do the heavy load. Remember to remove the headless: false option when you deploy on server. Another thing I noticed, you cannot go beyond 100 pages on GitHub. Here is the accompanying GitHub repository containing complete code. 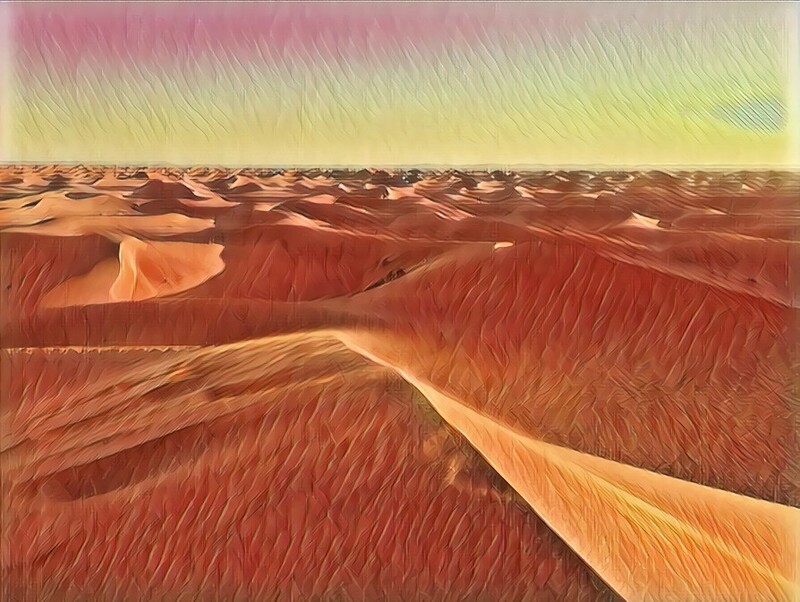 Deserts symbolize vastness and are witness of the struggles and sacrifices of people who traversed through these giant mountains of sand. Thal is desert in Pakistan spanning across multiple districts including my home district Bhakkar. Somewhat similar is the case with Internet that we traversed today in quest of data. That's why I named the repository Thal. If you like this effort do remember to star the project on GitHub :). If you have any suggestions/questions comment here or approach me directly @e_mad_ehsan. I would love to hear from you.